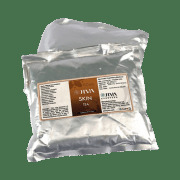 The Jiva Skin Tea is a handy addition to your home remedy kit for any skin problems that you may develop. It is a combination of ingredients that root out the cause of your skin maladies by going in far deeper than the skin. They cleanse the body systems and prevent the recurrence of skin conditions. Completely natural and picked from organic environs, its ingredients have given results for centuries. Moreover, they are balanced to remedy dosha vitiation in body systems preventing other diseases that may be in the making without your knowledge. Try it now and find out for yourself. It is totally free from side effects. A licensed pharmacy from your nearest location will deliver Jiva Skin Tea. Once the pharmacy accepts your order, the details of the pharmacy will be shared with you. Acceptance of your order is based on the validity of your prescription and the availability of this medicine.